As a child Mike dreamed about dropping out of school, and exploring the islands of Fiji. He attempted this in 5th grade, but failed to make it past the county line. It's this adventurous spirit that gives Mike the strength to explore the fearsome world of web technology. Before discovering the programming philosophies of Richard Stallman and Eric Raymond, Mike served his country as a U.S. Marine, and earned a B.S.E. in Nuclear Engineering from the University of Michigan. Prior to joining Mediacurrent Mike spent four years helping Drupal merchants hawk their wares online. 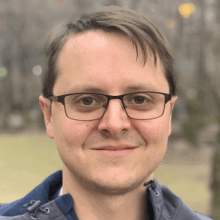 He has integrated more payment gateways into Drupal sites than he cares to remember, and lead the architecture on fundamental Commerce modules that were ultimately contributed back to the community e.g. commerce_shipment. Notable merchants include Duck Commander, Blissworld, Stanford Linear Accelerator, and Stratfor. Mike tries hard to live by the three virtues of a great programmer. He takes pride in his trolling abilities, and believes QA is consistently under-appreciated in his industry. Heavy metal is his music of choice while programming. Ping Pong is the only sport he acknowledges.